The restaurant industry has a wide variety of employment opportunities. Unfortunately, food service workers are vulnerable to many different types of injuries. According to the Burn Foundation, the food service industry has more employee burn injuries than any other occupation. Food preparers, other kitchen workers, and wait staff are particularly susceptible to burns caused by hot foods and beverages, fryers, ovens, stoves, and dishwashers. Lacerations caused by sharp utensils and other kitchen tools. Contusions due to slip and fall accidents on slippery or greasy floors. Injuries caused by a vehicle accident while delivering food. Sprains and strains due to lifting and moving tables and chairs, and reaching across tables. There are two types of compensation that may be available to injured food service workers: workers’ compensation insurance and third-party liability claims. 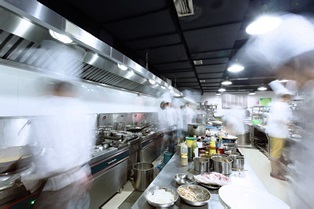 Workers’ compensation covers a wide variety of job-related injuries suffered by kitchen workers, wait staff, bartenders, and delivery drivers. Injured employees who qualify for workers’ compensation are entitled to medical care, wage replacement benefits, disability payments, and vocational rehabilitation. These benefits are available to workers regardless of fault, and there's no need to prove employer negligence in order to receive compensation. If an employee was injured due to the negligence of someone other than his employer, he may be eligible to pursue a third-party liability claim. For example, the manufacturer of a defective piece of kitchen equipment may be held liable for burn injuries suffered by workers. If you’ve been injured while working for a restaurant, you need an experienced personal injury attorney to help you receive the compensation you deserve. Your attorney can gather evidence of your injuries; help you pursue workers’ compensation benefits; and file a lawsuit to obtain damages in a third-party case. To discuss your claim, contact the law offices of Steve M. Lee, P.C., by using the form on this page.